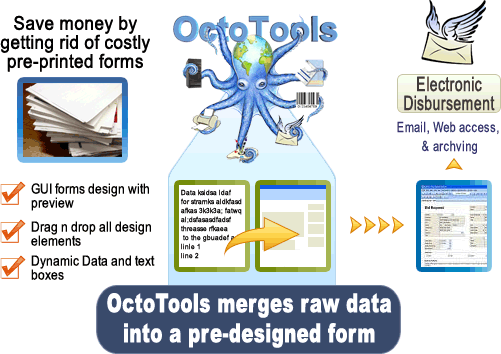 OctoTools is a document management tool that encompasses Variable Data Printing Software,Forms Design, Report Formatting, Electronic Distribution, Printing, and Text to PDF conversion. Once set up, OctoTools runs automatically to provide high volume throughput without operator involvement. 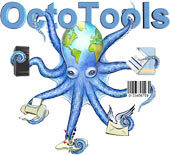 OctoTools is composed of two main modules; OctoDesigner and OctoToolsRTE (Run Time Engine). The data recorded on a single CDROM can save a minimum of $1570 and storage space for almost 1000 pounds of paper. A common 100 gb hard disk can save an organization over $875,000 and storage space for more than 25 million pages, 480,000 pounds of paper. Download our Excel spreadsheet and compute your own ROI! Businesses of all sizes, small through Fortune 500. Federal, state, county and city governmental agencies. Colleges, universities and educational consortium. Healthcare providers and insurance carriers. Products are trade marks and registered trade marks of their respective manufacturers: Objectif Lune, Printech Inc. , ForTrap Inc., RJS Software Inc., Create!form, Cardiff Inc., Acom Inc.Business Objects, PeopleSoft, IBM Corp., SAP AG, Sungard SCT, Karmak Inc., JD Edwards, Infor and Fiserv.